Corner Bolts are the quick and simple way to attach a square post to a square tube anchor. 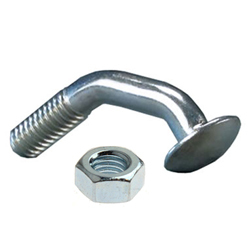 Requiring only a single wrench, the corner bolt provides a tighter more stable installation by concentrating tension on only one corner of the tubing. Corner Bolt should always be attached to the corner farthest from traffic.